Celebrate the accomplishments of those who have dedicated their talents to spreading a leafy green canopy over Texas by nominating them for the 2018 Texas Community Forestry Awards Program. This program is open to anyone who has a role in building stronger communities by planting, maintaining or protecting trees. 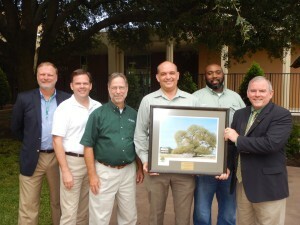 Winners will be recognized during the 2018 Texas Tree Conference in Waco on Thursday, September 27th. Each award winner will receive a numbered, remarked and framed, limited-edition print of a famous Texas tree painting especially commissioned for the program. The Texas Community Forestry Awards Program is sponsored by the Texas A&M Forest Service and the Texas Chapter of the International Society of Arboriculture.